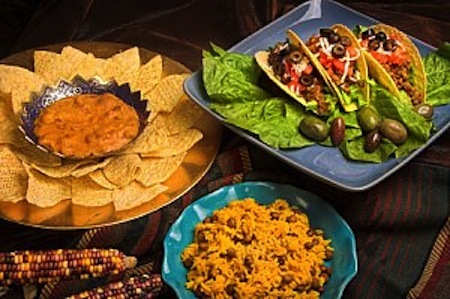 A Mexican fiesta theme dinner. 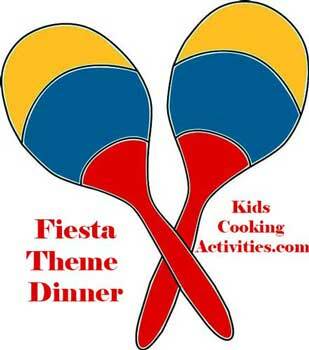 Come to the Mexican Fiesta theme dinner wearing Sombreros, ponchos and sandals. Decorate with pinatas. You can even learn how to make your own pinata! Place a large sombrero in the middle of the table or a dish of salsa and chips. Or place the pinata cookies on a serving dish for the middle of the table. Use the Mexican recipes from our World studies section to complement your fiesta. More Mexican menu ideas could be a taco salad or taco bar. Place different taco ingredients in small bowls around the table. Let everyone make their own taco or taco salad. We actually were served this at a restaurant. The kids LOVED it and it was incredibly easy to reverse engineer. Just place beans and enough broth to loosen it up into a soup in a small pot. Heat and serve with the topping of your choice. Ridiculously easy. Cook a family size bag of spaghetti noodles. While noodles cook make sauce. When noodles are done put in a glass casserole dish. Layer noodles, cheese, noodles, cheese in a large pan. In a medium pan, melt the stick of butter, 1/2 of the big tub of daisy sour cream and the full can of tomato sauce. Bring it to boil slowly and when all mixed together and hot, pour sauce over noodles and cheese. Cover dish and wait until cheese melts or put in oven at 350 degrees for 10 min. It is so good and I have not seen a kid yet not like it and want more. These cookies are a fun desert for this theme party. 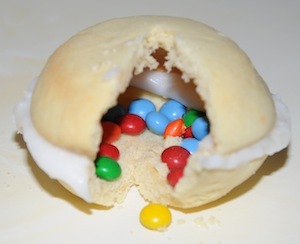 Two cookies frosted together with candy filled inside just like a pinata! Prep your sugar cookie dough and roll out with a rolling pin. 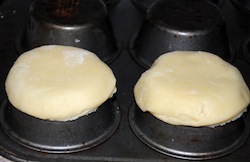 Use a large circle cutter or bottom of a glass that is a little larger than the bottom of your muffin tin. You'll be turning your muffin tin over and use the bottom. Cut out circles and place around the bottom of the muffin tin. Bake until golden brown. Allow to cool and gently take off tin. 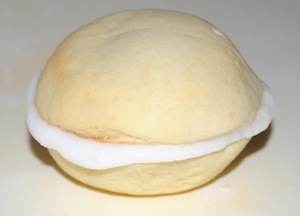 Fill one cookie with your candy and with a piping bag pipe frosting around top edge of cookie. Place a second cookie on top and seal together your pinata. Need Mexican Theme Dinner Party Supplies? Take me back to theme dinner ideas from fiesta theme dinner.